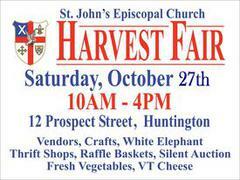 The Annual Harvest Fair is the single largest fundraising event at St. John’s and is organized by the ECW. The Fair takes place at St. John's on busy Main Street in Huntington NY. The entire community attends the Fair, live music is featured; and local produce and regional fresh cheese are sold. Hand-made craft items are created by the members of St. Hilda’s Guild for sale at the Fair, and the word on the street is that the best Bake Sale in Huntington is featured in the Great Hall on the Fair Day. Also, look for the Thrift Shop and White Elephant Sale.